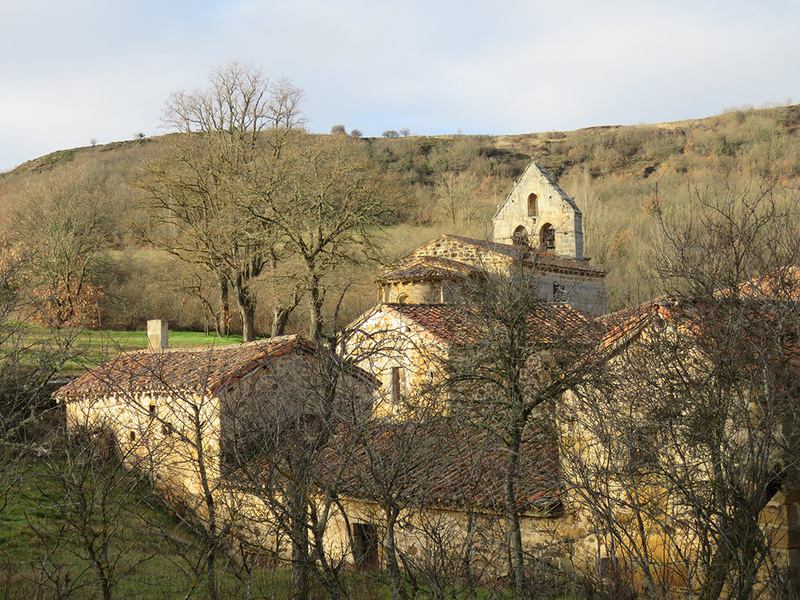 The Cantabria Traditional Architecture Summer School 2019 will take place in Valderredible, the southernmost area in Cantabria (Spain), in the high course of the Ebro River, 8-21 July. The application and registration process is now open. Local traditional urbanism, architecture and building details will be studied in order to create a preservation and new traditional building manual for the area and, based on it, to design upgrade proposals for different public places of the town. Participants will have the chance to share ideas and work together with faculty and students from many nationalities in order to develop those proposals. Experts in local vernacular architecture and building techniques will be lecturing on diverse related topics. There will be trips around the region and some workshops and building sites will also be visited. The registration fee is 300 euros. This fee includes tuition, accommodation, meals and transportation during the two weeks of the Summer School (departure from and to Madrid also). Those interested in participating can fill in the application form here or send an email to: premiorafaelmanzano@gmail.com. There are a number of grants available, thanks to the Fundação Serra Henrriques and Mina and Alireza Sagharchi. 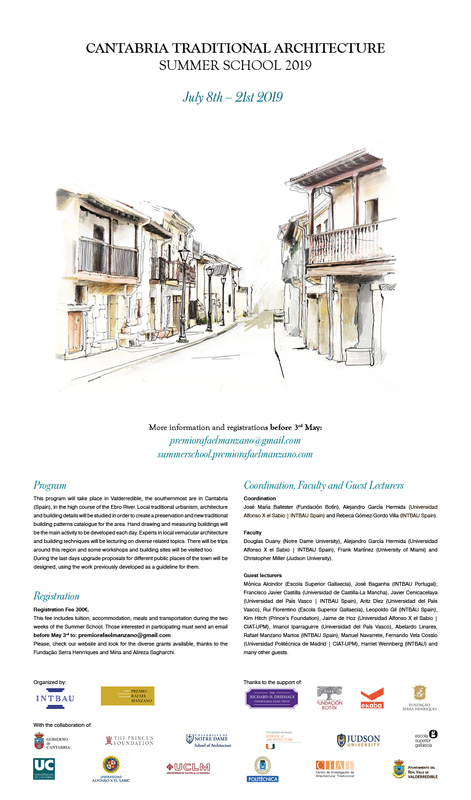 The Summer School is organized by INTBAU and the Rafael Manzano Prize for New Traditional Architecture, thanks to the support of the Richard H. Driehaus Charitable Lead Trust (through a contribution to the Chicago Community Foundation for the Richard H. Driehaus Charitable Fund), the Fundación Botín, the Fundación EKABA and the Fundaçao Serra Henriques, and the collaboration of the Government of Cantabria, the Escola Superior Gallaecia (Portugal), the School of Architecture of the Judson University, the School of Architecture of the University of Miami and the School of Architecture of the University of Notre Dame (USA), the Universidad de Cantabria, the Universidad Alfonso X el Sabio, the Universidad de Castilla-La Mancha and the Universidad Politécnica de Madrid (Spain), the Centro de Investigación de Arquitectura Tradicional (CIAT-UPM) and the Municipality of Valderredible. Faculty and organising team will be José María Ballester (Fundación Botín), Douglas Duany (University of Notre Dame), Alejandro García Hermida (Universidad Alfonso X el Sabio | INTBAU Spain), Rebeca Gómez-Gordo (INTBAU Spain), Frank Martínez (University of Miami) and Christopher Miller (Judson University), and the guest lecturers: Mónica Alcindor (Escola Superior Gallaecia), José Baganha (INTBAU Portugal), Francisco Javier Castilla Pascual (Universidad de Castilla-La Mancha), Javier Cenicacelaya (INTBAU Spain), Aritz Díez Oronoz (University of the Basque Country), Rui Florentino (Escola Superior Gallaecia), Leopoldo Gil Cornet (INTBAU Spain), Jaime de Hoz Onrubia (Universidad Alfonso X el Sabio | CIAT-UPM), Imanol Iparraguirre (University of the Basque Country), Elena Jiménez Sánchez, Abelardo Linares del Castillo-Valero, Rafael Manzano Martos, Manuel Navarrete, Fernando Vela Cossío (Universidad Politécnica de Madrid | CIAT-UPM) and many other guests.